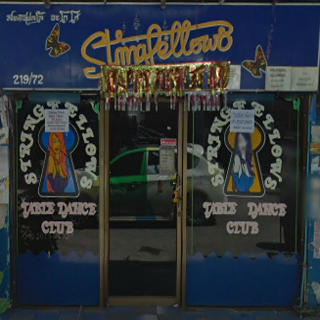 Stringfellows has been around for a number of years and with good reason, it's perhaps one of Pattaya's naughtiest go-go bars; it's certainly a favorite among ladyboy afficionados that like go-gos. It's a small and intimate venue, and upon first walking in, one might think what's so special about this place? Black lights? Day glo paint? A little seedy? Girls dancing on poles? You can see this at a hundred different bars in Pattaya. No, what makes Stringfellows a legendary favorite for many are the ladyboys. In this venue where the poles are only an arm's length away from your table, the girls are known to be … how can we put this delicately? Well, the Stringfellows girls are certainly not shy or bashful in the least. It's not uncommon, with just a little bit of encouragement from the audience, for bikini bottoms and/or tops to be doffed and for tumescent naughty bits to be unleashed. Don't say we didn't warn you! Stringfellows is conveniently located at the opposite end of the soi from La Bamba; many like to stop at both bars: some get their liquid courage up at La Bamba then enter the lions' den of Stringfellows; others stop into La Bamba after their adventures at Stringfellows to wind down. Worried about getting too wound up at Stringies? There are short-time rooms upstairs, accessible from within the bar.